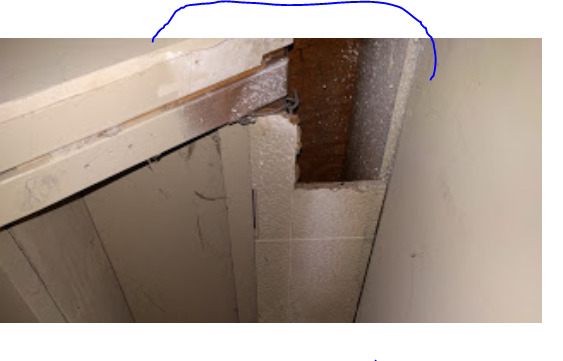 I'm looking to build a reading nook under some stairs but there currently seems to be a support structure of some kind that I would like to remove. I've tried finding if this setup is part of code or just good practice but so far have been unable to find anything except for a mention related to very long exterior deck stairs. The length of the stairs are just shy of 10 feet. 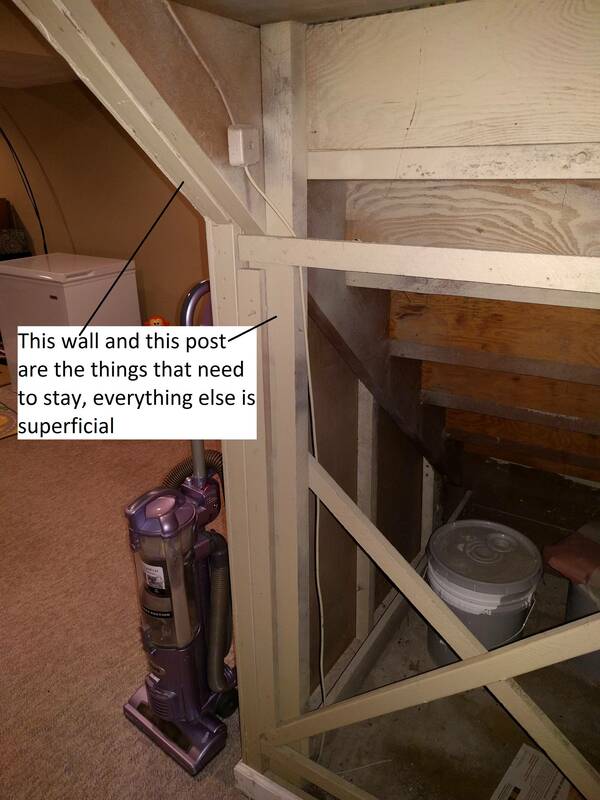 Here is an image of the support structure under the stairs. At a minimum I would like to remove the cross bracing but if I can remove all of it (there are some boards that run to the back of the stairs at the bottom) I would like to so that the area is a little wider. Is this something I can take down, either partially or completely? Other parts could be removed but the stair would be bouncy, and would need reinforcement to make it act right. It would be helpful to get a better and more inclusive picture in the area indicated by my blue line. 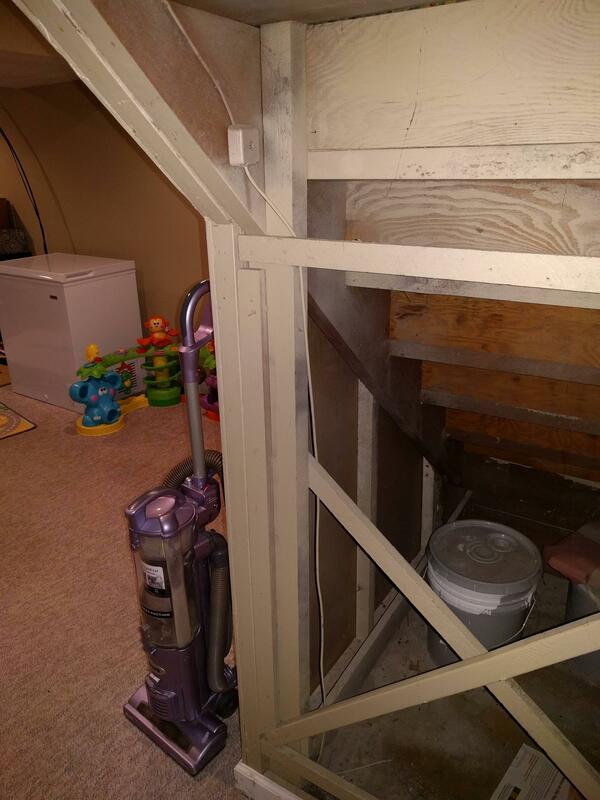 The stair jack on this side appears that it is simply ending at a cantilevered joist that is unsupported. The notched hole just below my blue line seems to imply that there may have been a vertical support coming down from this point at one time. This side of the stairway could be quite bouncy. 1) Improve the anchoring of the stringers at the top using adjustable-angle joist hangers, simple angle brackets, or any other suitable mechanism. Use construction adhesive wherever possible to add strength and prevent squeaks. Nail per manufacturer's spec. 2) Glue and screw 2x4 (or 2x6 ripped to the maximum available width) lengthwise to the inner faces of the stringers to act as stiffeners. Select lumber that has few, small knots. With only two stringers, this is critical. I'm assuming here that your stairs are no wider than 36". If they're wider, add a third stringer in the center and also sister lumber to its sides. The carpet on my stairs is worn. Should I repair it or just remove it? Is it safe to remove risers from stairs?